OGHAM RINGS : BRITISH Made : LOVE2HAVE in the UK! The BEST! British made Ogham rings for men and women at the lowest prices online, and all with a FREE personalised Ogham engraving of your very own choice. All of our beautiful Ogham rings are hand machined in Central England, the heart of the UK's jewellery industry. Each ring is precision lathed in either 9ct white, yellow gold or titanium. The Ogham engravings can all be personalised with your very own message, therefore making them a very suitable choice for a wedding ring or indeed an exceptional gift for him or her. Ogham was an ancient written language that originated from Ireland dating back to the 4th century AD. Ogham, spoken verbally with a silent 'g' (so pronounced correctly as "Oh-um"), is to be found carved into stones as well as trees and is therefore also known as the tree alphabet. We have written an entire article on the Ogham alphabet which you will find in the information and resources section of our website. As well as being precision lathed all of our Ogham rings are also precision laser engraved to the highest quality and finish. The titanium versions are particularly notable and not only being exceptional value for money also make great Ogham rings for men. 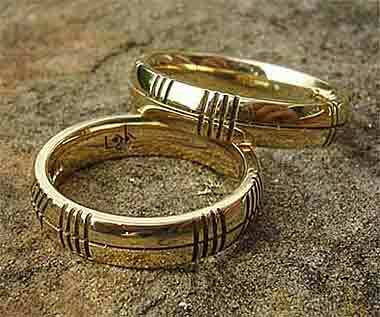 The range caters very well for couples and the wider and narrower widths available make stunning Ogham ring sets.